1. Remember the formula. Prayer, Fasting, and Almsgiving are the three things we need to work on this season. 2. It’s time for prayer. 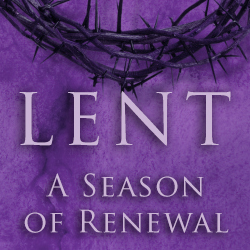 Lent is essentially an act of prayer spread out over 40 days. 3. It’s a time to fast. With the fasts of Ash Wednesday and Good Friday, meatless Fridays, and our personal disciplines interspersed, Lent is the only time many Catholics these days actually fast. 4. It’s a time to work on discipline. Instead of giving something up, it can be doing some- thing positive. 5. It’s about dying to yourself. The more serious side of Lenten discipline is that it’s about more than self-control – it’s about finding aspects of yourself that are less than Christ-like and letting them die. 6. Don’t do too much. It’s tempting to make Lent some ambitious period of personal reinvention, but it’s best to keep it simple and focused. 7. Lent reminds us of our weakness. This can be painful, but recognizing how helpless we are makes us seek God’s help with renewed urgency and sincerity. 8. Be patient with yourself. God is calling us to be patient and to see ourselves as he does, with unconditional love. 9. Reach out in charity. Almsgiving is about more than throwing a few extra dollars in the collection plate; it’s about reaching out to others and helping them without question as a way of sharing the experience of God’s unconditional love. 10. Learn to love like Christ. Lent is a journey through the desert to the foot of the Cross on Good Friday, as we seek him out, ask his help, join in his suffering, and learn to love like him.